What qualities define a healthy parent-child relationship? Bringing a multitude of positive characteristics to mind, ideally, nurturing relationships can be defined by mutual respect and acceptance. Many of us find ourselves struggling to maintain positive connections, there's particular attention given to the quality of mother-daughter relationships. Starting the conversation focused on practical ways to foster stronger mother-daughter relationships, Mended: Restoring the Hearts of Mothers and Daughters, by Blythe Daniel and Dr. Helen McIntosh, shares powerful conversation starters useful for speaking life into relationships between mothers and daughters. Thank you to Blythe Daniel and Dr. Helen McIntosh, and their promotional team for the courtesy of providing an Advanced Reader Copy as a contributor to the Mended Launch Team, for editorial content purposes. This content may contain affiliate links. Have you ever felt compelled to open the floodgates of your heart to another person, however, the words to open up the discussion were buried beneath emotions? That's an understandable situation so many of us find ourselves faced with in many situations. Using Mended: Restoring the Hearts of Mothers and Daughters as a valuable resource to uncovering the empowerment within ourselves to effectively move forward in a caring, compassionate direction toward restoring and reconnecting relationships with loved ones. 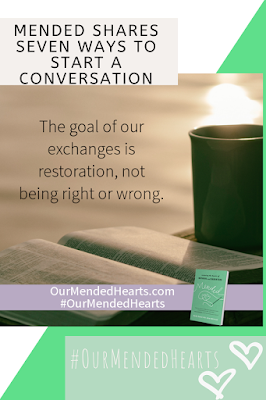 Reading Mended, the chapter which really resonated with me on a personal level was titled- Say What When: Words to Love and Live By, guides us through ways of establishing common ground to build important conversations. I'll share this essential key I've come to understand, to successfully maintain almost any relationship, be open by resisting trying to control or change one another. "If you have a difficult history with your mother or daughter, you don’t have to continue those patterns of brokenness." Conversation Starter #1 - "What I want is a good relationship and you are more important to me than this problem or difference of opinion/snag." Conversation Starter #2 - "I want us to be repaired. What do you need to hear/see from me or what do I need to do for us to be repaired? I want to clear up any offenses on my part." Conversation Starter #3 - "I want to be a healthy mother, but I see signs of my living a life through you. I’m asking God to help me detach." Conversation Starter #4 - "I want us to have a good relationship. We do have a problem, but I believe we can make a repair. What do you think we need to do to make things better?" Conversation Starter #5 - "Are you okay if I share some feedback/ideas? May I share a concern?" Conversation Starter #6 - "How do you see me helping you but not controlling?" Conversation Starter #7 - "I don’t know what to say, but I care about you. What do you think we need to do to make things better? What role do you see me playing?" Blythe Daniel and Dr. Helen McIntosh. 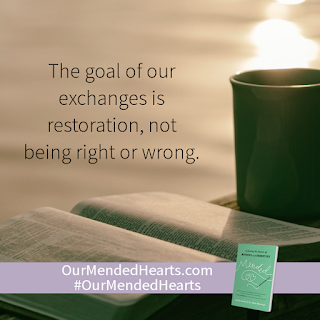 Read Mended: Restoring the Hearts of Mothers and Daughters today to start your #OurMendedHearts conversation.